Please pray for my Mother, Martha Boggs. She had a pacemaker put in yesterday evening. She came through the surgery fine and was doing well the last time I talked to Dad about bed time. She will spend a few days in the hospital recovering and receiving treatment for another heart issue. We are asking God to strengthen her quickly and we appreciate you joining with us in praying. Do you remember This Post back in July? 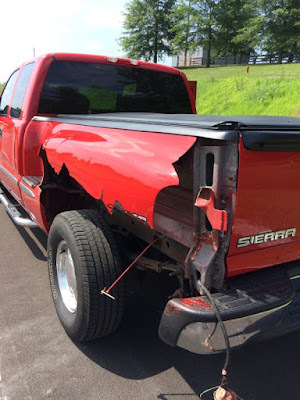 Dad's beautiful GMC truck was nearly destroyed when it was brutally attacked by a deer that was thrown into them after hitting an oncoming car. Dad and Mom and the people traveling behind them were all very blessed not to be severely injured. 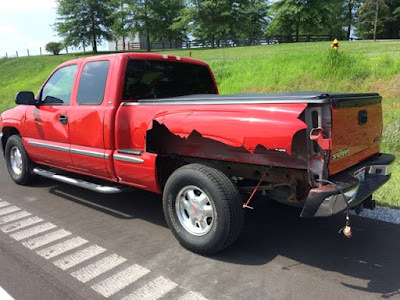 As you can see, the truck was not so fortunate. It took a while to get the truck in for repairs but he now has the truck back home. The repair shop seems to have done a really professional job and GMC is beautiful once again. That is all I have time for today. Thanks for reading.